Behavioral health was an issue we avoided during my 20 years as an Army Infantry officer. It wasn’t until I began working for a national behavioral health company nine years ago that I understood the value of timely behavioral health care for our military. Through Chris Kyle’s story, America saw three key elements of behavioral health support that can lead not only to recovery but also to growth for an individual exposed to extreme physical and mental trauma, often referred to as post-traumatic growth. For many, that education came overnight. One recent box office hit gave more than 25 million Americans a realistic view of the importance of behavioral health support for the recovery and growth of service members. American Sniper, directed by Clint Eastwood and starring Bradley Cooper, tells the life story of Navy Seal Chris Kyle, the deadliest marksman in U.S. military history with 160 confirmed kills during four combat tours in Iraq. The movie highlights the difficulty of war on our service men and women, in general, and the individual stressors built up over time with being the nation’s deadliest marksman, in particular. As strong as Chris was, his mental health could not withstand the crushing pressure of his wartime experiences. Through Chris Kyle’s story, America saw three key elements of behavioral health support that can lead not only to recovery but also to growth for an individual exposed to extreme physical and mental trauma, often referred to as post-traumatic growth. Family members are combat readiness multipliers, who seldom receive notice or thanks for the load they bear. In American Sniper, Chris’ wife, Taya, tries to convince him each time he returns from a deployment to seek help as he grows more isolated from the family. It isn’t until he nearly kills the family dog during a backyard barbecue that his family is finally successful in getting him to seek help through the Department of Veterans Affairs (VA). That visit turns out to be life-changing. Just as Taya was to Chris, family members are invaluable support structures to the service member living with significant daily stressors before, during, and after deployments. However, military families need support as well, or their reserve tanks will run dry. 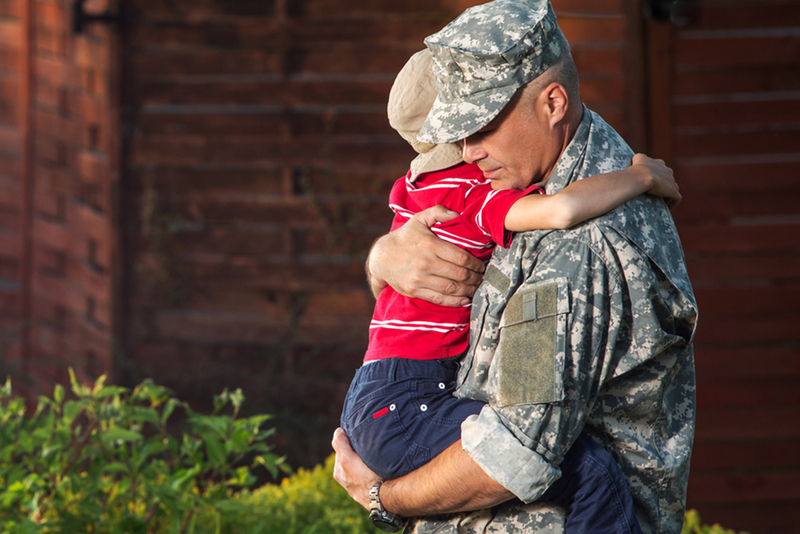 Fortunately, many resources are available that specifically target and support military families during all stages of their military and post-military journey, such as Military OneSource, a 24/7 resource for assisting military families and TRICARE, the military’s health care program. Also noteworthy, the National Military Family Association offers scholarships to military spouses, summer camps for military kids, family retreats, and advocacy efforts to protect military family benefits. Where behavioral health counselors may have to work through the rapport-building process to gain credibility, the peer can be an instant and significant supplement in support of ongoing behavioral health counseling. During Chris’ VA counseling encounter, the therapist applied his awareness of military cultural nuance to guide his reluctant client onto a path of recovery. Using Chris’ innate need to protect and assist his fellow warriors, the therapist was able to redirect Chris’ focus to talking with (and trying to “save”) other veterans at the VA hospital with both visible and invisible wounds. This later motivated him to provide group and one-on-one peer support for other veterans in the community. Having counselors with an understanding of military culture is key, especially in those initial sessions. Military community and family support programs such as Military OneSource provide ready access to short-term counseling, warm transfers to mental health counseling, and an extraordinary array of support services, including military peer support. This is where peers (generally veterans who have successfully dealt with their own mental health recovery) are of great therapeutic value. Where behavioral health counselors may have to work through the rapport-building process to gain credibility, the peer can be an instant and significant supplement in support of ongoing behavioral health counseling. Peer consultants come to the table with ready-made credentials (“been there, done that”), making rapport-building, and ultimately recovery and growth, a much faster process. American Sniper is a significant movie in that it highlights the post-traumatic growth we see in the typical veteran integrating back into our communities, reinforcing the importance of mitigating the stigma associated with military personnel seeking behavioral health services. Doing so is critical to combat readiness and to supporting service members, veterans and their families in remaining on a positive personal and professional trajectory. Make the Connection: VA online resource that connects veterans and their friends and family members with information, resources, and solutions to issues affecting their lives. Coast Guard Support Program: A 24/7 resource for assisting Coast Guard active duty, reserve and civilian employees and their families. Military Culture: Core Competencies for Healthcare Professionals: A DoD/VA resource for educating clinical civilian providers in military culture: Four, two-hour modules with two free CEUs earned for each module completed. Thank you, Dr.Scroggs for this informational and insightful article on post-traumatic growth. I appreciate the additional resources that you listed in the article. As a nurse clinician within our behavioral health company and a spouse of an Army veteran (and daughter-in-law to a Navy veteran), I am familiar with the military culture and the stigma associated with military personnel seeking behavioral health services. This article is ready made for sharing with my family members as well as my colleagues. I wish I had this information while my spouse was an active duty member! Thanks again! Thank you, Ruth. I wish I had this information when I was on active duty 1976-96. But it is never too late to just talk about these services and approach them openly just as you would if you or a family member sought services for a fever or hurt ankle. Thanks again, Ruth. Thanks, Steve for this great post. I have never served our country in the military, so I can only imagine what it must be like to return from combat abroad to everyday life here in the U.S. You state that behavioral health was something to be ‘avoided’ during your time in the Army, but my sense is that is rapidly changing with the military putting ever-increasing emphasis on reducing stigma and providing access to quality behavioral health care for servicemen and women and their family members as well. Would you agree? I would definitely agree, Tom. There is night and day difference in the genuine interest and emphasis now placed by our military civilian and uniformed leadership on getting our service members timely behavioral health services today compared to when I retired in 1996. However behavioral health stigma is a cultural obstacle both within the military as well as throughout our nation as a whole. Therefore getting service and family members to overcome a longstanding cultural resistance to seeking services can be difficult and slow. You have to use (military) culture to change dysfunctional aspects of that same organizational culture. Thank you for the article with valuable information included Dr. Scroggs. Having been a civilian clinician within the Army Familiy Advocacy program for many years, and working with Wounded Warriors in addition, the stigma of going to Behavioral Health was a persistant barrier to overcome within the military family; particularly with senior officers. I agree that in today’s military there are more personnel taking advantage of the mental health system to gain strength, rather than viewing seeking help as a sign of weakness or as having fear of losing rank. As a mother of a clinical social worker, daughter working with Army Rangers seeking help for mental health concerns, and in addition to being a wife of a Special Forces officer, she values that she is “helping one of our own” and utilizes the many resources the military now has available to assist those struggling with post trauma symptoms. She is often acting as a “Single Mom” as many other military spouses do when their partners are in training or deployed. Building spousal resiliency is key; however that is for a future blog! Thank you again for providing this valuable education regarding our military community and thank you for your service to our country as a soldier in the military and a soldier in civilian life. It’s a pleasure to work with you within our Beacon Health community to promote stamping out the stigma of mental illness. Betty, Thank you for your work with the Army Family Advocacy Program and helping our Wounded Warriors. Your daughter who helped Rangers receive behavioral health care and is married to a Special Forces officer is in a great position to let these elite service members know that their willingness to maintain combat readiness by seeking early and timely care if they later speak of it openly can make it significantly easier for other service members to reach out for behavioral health services as well. Am already working on your suggestion to address ‘building spousal resiliency’. Thanks to you and your daughter! I really liked your post. PTS is real and treatable, once the stigma of seeking help can be overcome and access to appropriate mental health care is readily available and utilized. Although our nation has come a significant way in addressing behavioral health, the stigma associated with it is very real and needs to be openly addressed, questioned and eliminated. I liked your often missed focus on post-traumatic growth, once services are used and supported, rather than on the damaged or broken veteran. Thank you for sharing the links on available military and veteran resources. I think as movies like, “The American Sniper”, are seen, your article and resources shared, and these successful programs used, the progress the military will eventually make in this critical healthcare area will become more evident with their civilian counterparts, resulting in healing, restoration and stronger lives. Linda, Agree wholeheartedly with you that while we are hearing and seeing clear advances in the area of mental health services, stigma surrounding openly seeking such services is significant and still stands 10 feet tall before many service members and their families. The stigma has a cultural basis and changing culture takes time. Additionally being concerned about existing stigma, in certain instances, is rational. If you talk with experienced senior military psychatrists, they will acknowledge that there are still examples of military policies and requirements that if a service member seeks or acknowledges receiving mental health care- could make them less competitive and/or make it more difficult or impossible for that service member to qualify for civilian DoD positions in their area of expertise following their uniformed military service. Stigma is real and needs to be continually battled at all levels.